The first place Dallas Cowboys will attempt to drive the New York Giants further down the division ladder this weekend when they visit the Meadowlands. The very real prospect of a playoff birth weighs heavily on the minds of everyone in Cowboys nation, but according to a team of scientists it may be all for not. Physicists have suggested that a playoff victory might be so abhorrent to nature that its achievement would ripple backward through time and stop the Cowboys before they could win, like a time traveler who goes back in time to kill his grandfather. The theory was a largely overlooked footnote in a series of papers by Holger Bech Nielsen, of the Niels Bohr Institute in Copenhagen, and Masao Ninomiya of the Yukawa Institute for Theoretical Physics in Kyoto, Japan. 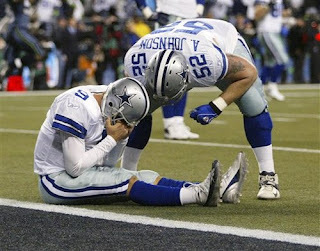 The papers mostly outline theories regarding the abhorrent nature of the Higgs Boson, the theoretical particle responsible for imbuing other elementary particles with mass; however, the inevitable failure of the Dallas Cowboys in the month of December and beyond was also evidenced by the research. The research was predictably met with skepticism and disappointment by Cowboys owner Jerry Jones, who was quick to site the Cowboys' multiple past playoff wins. The mathematical models, however, suggest the Cowboys may have reached a “critical mass” of wins in the late 20th century, 1996 to be precise. Jones brushed off comparisons between the $1.15 billion Cowboys Stadium and the $9 billion Large Hadron Collider as silly and unimaginative.